I too prefer candid conversations over diplomatic pillow talk. Lets be honest, it’s not actually difficult to disrupt the humanitarian system. It’s hierarchical, overly bureaucratic, slow, often unaccountable and at times spectacularly corrupt. But I want to make sure my tone here is not misunderstood. I want to be constructive but playful and provocative at the same time, to “lighten things” up a bit. We often take ourselves way too seriously, too often. That’s why I absolutely love the term Crowd-Sorcerer! Lets use Muggles for our humanitarian friends. I’ll first lay out some of the frustrations aired by the Muggles in their own words so I don’t misrepresent their concerns—some of which are obviously valid (but not necessarily new). I’ll be reviewing these concerns in a series of blog posts, so stay tuned for future episodes in the new Crowd-Sorcerer Series! Caution: in case it’s not yet obvious, I will be deliberately provocative and playful in this series. 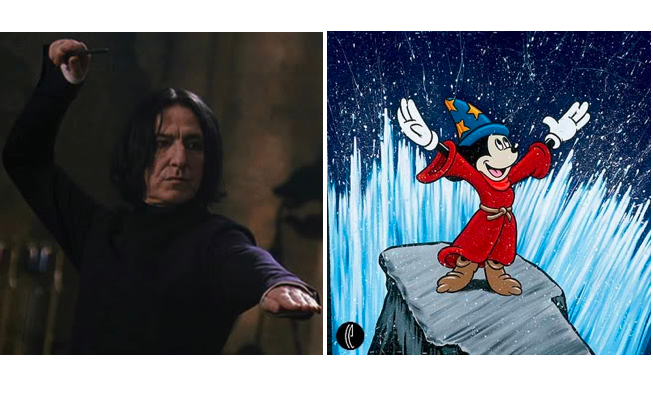 Muggles: Unless there are field personnel providing “ground truth” data, consumers will never have reliable information upon which to build decision support products. Crowdsourcing may be a quick way to get a message out, but it is not good information unless there is on-the-ground verification going on. There’s another extraordinary story here, and that’s the story of Mission 4636. Tens of thousands of incoming text messages from disaster affected communities in Haiti were translated from Haitian Kreyol to English in near real-time thanks to crowdsourcing. These text messages were translated by thousands of Haitian Kreyol speaking volunteers from all around the world. Without this crowdsourcing, the Marine Corps, Coast Guard, FEMA and others could not have used the information streaming in from 4636 as effectively as they did. And guess what? The original platform that was used to do this translation-by-crowdsourcing was built overnight by Brian Herbert, a 20-something tech developer at Ushahidi. Where were the Muggles then? I’m sorry to put it in these terms but if we listened to (and waited for) Muggles all the time, then perhaps several hundred more people would have needlessly lost their lives in Haiti. A forthcoming USIP report that reviews the deployment of the Ushahidi platform found that Haitian NGO’s and local civil society groups were physically barred from entering LogBase—the humanitarian community’s compound near the airport in Port-au-Prince. One Haitian NGO rep who was interviewed said he felt like a foreigner in his own country when he wasn’t allowed to enter LogBase and attend meetings where he could share vital information on urgent needs. Now tell me, how is trashing Haitian text messages any different than physically excluding Haitians from having a voice at LogBase? Because the so-called “unwashed masses” don’t have the “right” credentials as defined by the Muggles? Either way, they are excluded from having a stake in the hierarchical system that is supposed help them. Incidentally, a fully independent evaluation led by a team of three accomplished experts in M&E (monitoring and evaluation) are currently carrying out their impact assessment of the Ushahidi deployment during the emergency period. They will be in Haiti to for the field work and yes, one member of the team speaks fluent Kreyol. The PI from Tulane University has over 20 years of relevant experience. It would make absolutely no sense for Ushahidi to carry out this review. Ushahidi has little to no expertise in M&E and such a review would likely be viewed as biased if Ushahidi was authoring it. In fact, Ushahidi didn’t even commission the evaluation, The Fletcher Team did, and they should be applauded for doing so. By the way, as I have blogged here, it is misguided to assume that experts in, say development, are by definition experts at evaluating development projects. M&E is a separate area of expertise and profession in it’s own right. Anyone who has taken M&E 101 will know this from the first lecture. 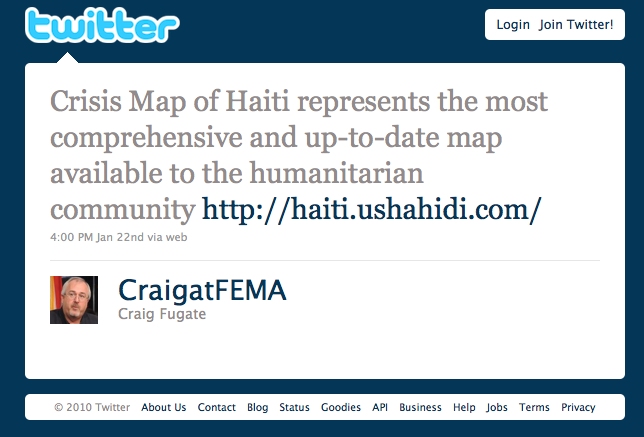 This entry was posted in Crisis Mapping, Crowdsourcing, Social Media and tagged Haiti. Bookmark the permalink. Interesting post. It seems this topic – crowd-sorcerering (I love that term, too!) – is closely linked to the conversations around aid/NGO transparency and accountability now gaining some momentum in the aid world blogosphere. It also seems like there is overlap with the citizen journalism conversation. For me in Haiti it came back essentially to a quality v. quantity issue. A driving assumption of the whole crowd-sorcerering hubub in Haiti seemed to be that some information, ANY information was better than none, or that information of ambiguous quality NOW was better than information of known quality later. It also seems that this kind of global crowd-sourcing brings us to something of a re-postmodern crisis: whose text message matters more? And on what basis do we decide? Thanks J., you too preempted my next blog post which makes the link with citizen journalism. Good point on the links with aid/NGO transparency and accountability. And yes, it would appear that Muggles would rather have no information at all than information of ambiguous quality which may/may not save lives. Exciting times indeed. While not a carbon copy situation we can think of the muggles complaints mirroring the complaints newspapers have towards crowdsourced citizen journalism; that everything outside of their own trained journalists is unreliable unless it can be verified by a slow news process. In the case of crowdsources news i’ve seen arguments for ‘statistical weight’ towards consistent reliability of a source. A source who regularly submits reliable and verified info will be expedited through the verification process compared to someone who is submitting for the first time. The problem with translating this to crowdsourced emergencies is that it can be a life or death situation. Also, you wouldn’t have the statistics there unless prior emergencies had taken place. Nevertheless I still wonder about the idea of power-rankings or statistical weight for emergency data and whether it’s something that could be organized by cities, neighborhoods, blocks or even apartments. A more locally delegated source would seemingly benefit two fold to be more reliable and also free up a barrage of texts/calls being made that would otherwise put stress on countries with little teleco infrastructure, like a Haiti. One of the reasons SwiftRiver is built the way it is is to avoid this very scenario Jason. You can opt-in to receive a users ‘history’ and use that to inform the filter or you can not, and just take all information on face value. As you use the system you’d be telling us who you want to hear more from and why (building up your own statistical trust values on the fly). This is because we can’t predict when and where the next global crisis will occur any more than you can, but we can help you sift through information faster than if you were relying upon existing disjointed methods (having 20 windows open trying to make sense of it all on your own). Having been directed to your blog via Twitter I found your post interesting on several counts. First are your comments regarding the modus operandi that humanitarian aid agencies work under. I recently undertook a product design commission for a portable wood burning stove used by Shelterbox, many of which ended up in Haiti. As I understand the situation often occurs where aid is slow to reach its intended destination due to a number of outside influences. Armed forces interfere, aid organization leaders are concerned about corruption and the media creating bad PR. Tom Henderson of Shelterbox is considered something of a maverick and is said to be a man who ‘gets things done’ so perhaps change is just around the corner with people like Tom setting a good example. Second, regarding your point about crowd sourcing. It is a phrase I am hearing increasingly often in the field of industrial design and innovation seminar. I do however have similar concerns to those of the aid workers responsible for filtering out the ‘wheat from the chaff’. Many design ideas coming forth from the ‘crowd’ are simply poorly formed. Good ideas or good information doesn’t’ always come from the ‘professionals’ mind you. Goodness knows there is plenty of poor design coming from so called professionals. In fact one high profile humanitarian aid product that has received much publicity and offer of investment has still not yet got to market. One of the product design companies involved had designed wheels on the mobile water container/filter that simply would bog down in soft ground. Here crowd sourcing would have worked well. By asking the local ‘crowd’, namely the individuals intended to receive the device could easily have pointed out what is a fundamental flaw and should be obvious. However Henry Ford commented many decades ago on this matter before it ever became known as the crowd when asked about asking people what they wanted. He replied “If I asked people what they wanted, they would have told me, a faster horse”. Therefore I would agree with the previous commentators and with your good self that having a ranking is an excellent beginning to a possible solution. The crowd is still young, but as one recent keynote speaker said at one seminar I attended “Not all the clever people work at here”. Thanks very much for taking time to share your informative thoughts, Lloyd. Great examples and comparisons! Glad you like the term, your initial reaction, in the email correspondence you describe above, suggested otherwise. You know very well the issues of sifting through thousands of email, sms and tweets to find out where the real needs are located. That is exactly why tools such as SwiftRiver exist, to make some sense of the sheer volume of data and try and prioritize response. All we are saying here is that an overwhelming sms response in a certain area clearly indicates a need. BUT what is needed? and what is the scale of aid required. This kind of clear targeted response is where we are all lacking, and this is the step that is missing for me. For me, the issues run deeper than this, and occurs way before a disaster even occurs. With effective emergency planning would we not already know where those who would need help would be? We know where all the world hot spots are, both in terms of man-induced disasters, and natural disasters, why are we not prepared when something happens? I don’t know the answer to this, but I think all our communities and our efforts to help, would have a lot more effect, if we were prepared before the fact. Would be happy to discuss this further. Maybe with some popcorn and watching the next Harry Potter film. Hi Craig, great to have you weigh in here! On the term “Crowd-Sorcerer”, I totally love it, thanks again for that! My reaction in the email was simply pointing to one of several contradictions I came across. Easy there Tiger, that was only the first blog post in reaction to the first part of the first email, there are 5 more posts (already written up) that I’ll be publishing. Oh, and you’re not quite right, that excerpt does not come from the same email, it’s taken from the second email. But I completely agree that second the email is a lot more reasonable and definitely different in tone from the first; a bit like the difference between the Old and New Testaments. So not to worry, there’s more commentary coming up on both the Old and New Testaments. By the way, that particular excerpt is contradicted by a number of other points in the email thread. Glad you already know about Swift River, that’s great. It’s definitely not a silver bullet or perfect, but the second version is already out so would love your feedback on how Crowd-Sorcerers can make it more useful to Muggles. “All we are saying here is…” Oh, but if that’s really all you are saying then why write 1,352 words in the email exchange? We definitely both agree on preparedness (which I’ve blogged a lot about), but that really ought to be the responsibility of the disaster management community more so than the Free and Open Source Software Community. Good post. I’m an independent journalist in Haiti, an earthquake survivor. You are absolutely right about the Log Base being inaccessible to Haitians – even the Mayor of Cite Soleil had immense difficulty entering. Most of the meetings inside are held in English or French, not Haitian Creole. Most NGO types acknowledge it’s a problem but they’re not doing anything about it. I was glad to meet Jaro when he was here managing the Ushahidi project in February and March. It sounded like making the incoming data actionable, and finding groups to follow up on it, were indeed his most difficult challenges. A UN worker was complaining about Ushahidi to me a few days ago, saying it’s unreliable. Reporting directly from earthquake victims is never perfectly reliable, of course, but what is? It should be a major input into any humanitarian’s workflow and for most of them here in Haiti, it isn’t. They’re too self-assured, thinking they know better than those they’re supposed to serve. That Haitians always exaggerate and are out to grab whatever aid they can. Part of that mentality is race- and class-ism. Ushahidi can amplify the voices of Haitians, but if humanitarian partners don’t care about those voices to begin with – what then? It was a small report on Ushahidi, referred to me through Twitter, that led me to write what was probably the first report on a forced eviction of IDPs from private property way back in March. Hi Ansel, thanks a lot for your input, I had no idea that even the Major of Cite Soleil had problems accessing Lob Base, wow. I hope all readers of this post read your comments. Thanks again.